These rock. Seriously. These chewy Gluten-Free, Dairy-Free Granola Oatmeal Cookie Bars really take the cake. They taste like an oatmeal cookie. They look like a granola bar. Yet they have the nutrition of a power-packed snack. My kids call these dessert. I call these another of my sneaky tricks. My husband? Well…he just calls me annoying. He has long since stopped being amused at how excited I get when I know my family is eating well, even when they do not. My favorite part about these is how easy they are to whip up. Just throw the dry ingredients into a bowl, add wet ingredients to a well in the middle, mix (aka, squish) everything together with hands, press into pan, bake, and viola. That is it. Thirty minutes later you have a delicious and nutritious treat. You can feel good about serving these as a snack. In fact, this morning, I gave each boy a nice sized bar (excuse me, cookie), a hard-boiled egg, and some fresh fruit (kiwi and Gaiya melon, to be exact). And as they bounded out the door and off to school, I actually felt pretty good about what their brains would be fueled with for the next few hours. And then I went and took a little nap. I wish. Who am I kidding? But I bet I had you going…or at least a little jealous of this said nap. 1. Preheat oven to 350 degrees. Grease a 9 x 13 inch glass baking pan. 2. Sift together in large bowl: Gluten Free Oats, Almond Flour (or Oat or Buckwheat Flour), Coconut Palm Sugar, Quinoa Flakes, Ground Chia (or flax or hemp) Seeds, Cinnamon, Sea Salt, and Dried Fruit and/or Nuts or Seeds. 3. Make small well in center of dry mixture. Add: beaten egg (or flax mixture), oil, syrup, and vanilla. 4. Squish/mix together with hands. Press into prepared baking dish. I like to not press all the way to edges (will not spread while baking), and instead leave a 1 inch border from edge of pan. This makes for a thicker and chewier bar. 5. Bake for about 30 minutes, or until edges look slightly golden. Center will look like it is not totally cooked. 6. Let sit for at least 1 hour before slicing. As it cools, it holds together better. I’ll take a batch! These are fantastic Kim. I bet the pistachios would taste amazing. I will put these on my list! I’d like a nap too! Gotta get my kids in school – lol! Hi Maggie! The pistachios are really yummy in these. I like to chop them up pretty small to disperse the flavor better. The kids love pistachios so they are a perfect addition to these! And you are right – you will definitely have more of a chance at a nap once the kids are in school (although i never seem to be too successful at it). Beautiful, delicious, and nutritious granola bars–it’s you who rocks, dear! You do realize the way you have chocolate chips listed, it looks like they are a dried fruit, right? May I say that chocolate chips are my favorite dried fruit then? 😉 These are similar to a granola bar I used to make, but much more nutrient dense and healthier, so I can just imagine how chewy they are and how great they taste. I’m imagining your little ones eating that wonderful breakfast before they heading out to school. Perfect. Ahhh! Shirley, as usual, you are way too sweet! And, I changed how the chocolate chips were listed. They too are my favorite “dried fruit”. LOL I guess i was on a roll with listing possible ad ins and just kept going. Thanks for letting me know. These are definitely chewy and delicious and they keep really well on the counter for a few days too. YUM!! Hello, Kim? You made what sounds like an awesome breakfast cookie! I mean, bar of delicious nutrition! Yes, just for a second I was jealous of that nap! Wish I could have one- and a snock bar too! haha, Intolerant Chef!! I wish that nap had been a reality. LOL! Kimmie, you must be feeling better to make such a fun treat. I can’t wait to try these myself, and guess what, I have all the ingredients. I love the way you artistically wrapped them for the picture. Cookies for breakfast? Love it! Especially when they’re packed with all of that goodness. Lucky boys! Thanks for sharing. Oh no you didn’t?! You cutely, individually wrapped breakfast bars?! I bow to your craftiness. Now if only we could combine my kid-free productive time with your creativity – a powerhouse I say! Oh how cute are these??? I love this Kim, especially since I just might be able to make them work while were on the MED (I think my boys are beginning to get “green smoothied” out, LOL!). LOL! THanks Heidi! I actually think that these WOULD work on the MED. Was looking at the ingredients again, and I think they would be okay for the most part. I can only imagine that your kids are getting tired of smoothies. I have to take breaks from them here in order to keep them on track with liking them! 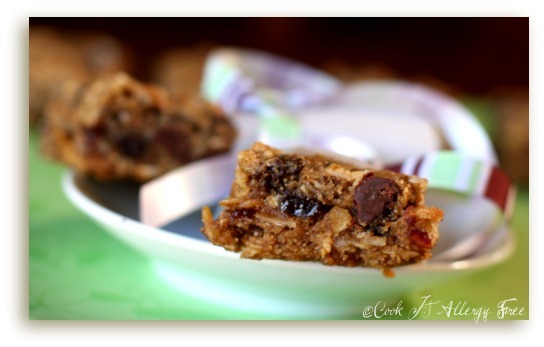 MMMMMMM,..your tasty & healthy breakfast bars look amazing & must taste wonderfully!! They are so stylish too! Nearly to pretty to savour!! Hi Sophie!! Thanks so much! You are too sweet! Hope you are doing well! What a great idea! We now have to make our own protein bars since we are cutting out so much stuff. Do you know how hard it is to find a good tasting, high protein (for Sam), gluten-free, dairy-free, bar? It’s not easy. They look so good, and I am hungry. I must move on. Tia, I do totally know how hard it is to find a good tasting high protein bar. That is why I am always trying to find new ones to make for us. I like having good snacks to take with us. My kids get so uber cranky when they are in need of protein! So, there I was. Last night. Getting ready to leave for our trip to Houston (which ultimately was canceled due to airport closures!). And I was thinking “Boy, I wish I had a granola kinda bar to take with us.” That was before I was your post. And then the trip got cancelled. And me – I’m making these first thing tomorrow. They look AMAZING!!!! And exactly what I need for when we travel (which we do a lot). I always like to have a quick pick-me-up energy kind of bar in my purse and this will no doubt do the trick. You are a genius! Ellen! So sorry your trip to Houston was cancelled. These would have made an awesome snack for the plane for sure! Hope you enjoyed your relaxing weekend at home though! I love healthy snack bars…constantly on the go I like to have something to pop into my bag for a quick bite to eat if I can’t stop somewhere. These will be perfect for that. Nancy, these are definitely perfect for a snack on the go. I put a couple in these small granola bar shaped tupperware pieces that I have and keep them in my purse for the boys. Perfect for when they need a pick-me-up! These “cookies” look amazing!!!! 🙂 I can’t wait to try them. However, we don’t eat grains. I’m looking for something to replace the oats with. Do you have any suggestions? Allyson, since you do not eat grains, you could replace the oats with more quinoa flakes (quinoa is technically not a grain). That would work really well….if you like quinoa! Just a thought! How do you store them, do they need to be in the fridge? I would love to add pumpkin any ideas if it will work? I can cook but I’m not good with altering things. Dee! Thank you so much for letting me know that you liked these bars! Ours do not last longer than a few days around here, so I just leave them on the counter. I have actually frozen a few before as well (but I did cut them into bar size first and then wrap them in saran wrap individually first before putting in a freezer bag) and they defrosted perfectly on the counter. If I was going to add pumpkin puree to these, I think that i would cut back the maple sugar to 1/4 cup (down from the 1/2 cup called for) and then add at least 1/4 cup pumpkin puree (I would even use as much as 1/3 cup). You just do not want the batter to be too wet. My son is so happy! We have now made pumpkin, blue berry/applesauce, and strawberry/banana bars. I did some more searching about replacing the egg, adding 1tesp. of Xanthan to the dry mix + using the flax gel made the bars hold together better, while still being soft. Here is the best part I was able to sub. 1/3 cup of the oil for caned pumpkin,or apple sauce, or mashed fresh banana. They all worked out fantastic! I have put them in the freezer and taken them out and they are still fantastic! This is good because, now we have a variety to pick from. For the strawberry/banana bars I sub. the 1 cup dried fruit for 1/3 cup each freeze dried strawberry, 1/3c banana chips, and 1/3 fine shredded coconut (both broken into smaller pieces) . For pumpkin bars I sub. 1tesp. pumpkin pie for 1 of the cinnamon. Wow! Dee, all of your options and substitutions sound absolutely AMAZING!! I am totally going to try some of these variations! Thank you so much for coming back and sharing your successes! During the holidays, that pumpkin version sounds AWESOME!!! Oh my heavens! I bet these make your kitchen smell awesome. I’m gonna give it a try for snack time today! I’m making these today! As a mom of four, I tend to make larger batches when I bake and freeze or store goodies and/or staples like this so that I don’t have to bake as often an dcan pop things out for a quicker breakfast (gluten free pancakes go in the freezer to get popped in the toaster, etc ). How would you best store these? In the freezer? Do they keep well? They sound/look wonderful, and may be an answer to breakfast prayers for my picky daughter! Hi! Found your blog through Elana’s Pantry! 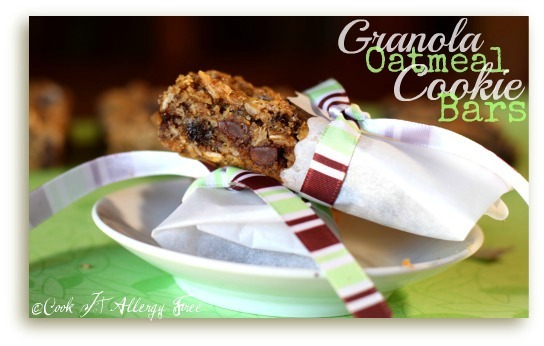 Made these granola bars and they were soooo tasty, we loved them! The only thing is that they were very soft and crumbly – we weren’t really able to eat them in bar form. Do you think I undercooked them? Any suggestions? Thanks! Hi Katie! Welcome to Cook It Allergy Free!! Is the coconut oil supposed to be melted 1st before adding it to the dry ingredients in this recipe? Hi S Carter. Yes the coconut oil should be in liquid form for this recipe. Hope you enjoy it! I read Maggie’s post from She Let Them Eat Cake and decided to make these right away. They are so good! My 2 year old helped me make them and of course he loved everything about them too. I’ll be sure to try some more of your recipes soon! I liked these bars — they were delicious BUT mine came out a bit crumbly and didn’t hold up on their own very well. I wonder if a need to add something to keep them sticking together properly? Any thoughts our ideas appreciated! Thanks! Glad you liked the flavor, but sorry they turned out crumbly for you. Just wondering if you make any changes to the recipe? I know that if you do not use the same amount of maple syrup/honey, or if you use the egg-replacement option, they will definitely be a bit more crumbly. Just curious if there were any substitutions or alterations that you did. Normally they hold together pretty good, as long as the binding ingredients (like the eggs or maple syrup/honey) are not altered. But, I know I have made them without the eggs before and they were more crumbly, and I have also made them cutting the maple syrup in half and those turned out fairly crumbly too. But they still tasted the same. Hope they turn out better next time!! Let me know if you made any changes~! I didn’t have quinoa flakes so I added more ground flaxseed . . . I kept the egg & maple syrup the same. So maybe that was it . . . I’ll try it again once I get quinoa flakes. Thanks for your response! So, I think that ground flaxseeds tend to be more absorbent than the quinoa flakes. So I am wondering if the flaxseeds ended up absorbing a lot of your binding moisture. Allergy friendly baking tends to be such a science experiment!! 😉 Let me know how they turn out next time! Thanks so much for this recipe. They are delicious! Do you have nutrition facts by any chance?? I can’t thank you enough for this post, seriously. My 5 year old loves granola but she has over 20 food allergies, including wheat and I could never find a recipe that was simple enough and didn’t take forever until I happened upon this. I’m happy to say that mine are done and cooling for 1hr right now. Smells divine! Ashley, I am beyond thrilled that you were able to make these work for your daughter’s allergies!! I hope that she loves them. I know she will appreciate all the hard work that you put into making her that happy little girl!! 😉 THank you so much for coming back and reporting your wonderful substitutions!! Oh and I didn’t have quinoa flakes so I just used extra oat flour. Dee, those sound yummy!!! I’m SO gonna try the pumpkin ones! My daughter is also allergic to cinnamon though so I;ll prob just use ground nutmeg. I made these today sans any nuts or eggs and flax so my one year old could enjoy them too. SO delicious Kim, finally a granola bar recipe I really LOVE!! Your such a genius my friend! My little man thanks you too…he is snacking away happily right now…. I used your suggestions, chia meal, chia meal egg, and oat flour! I know too well…i feel the same way! Could I share your recipe on my blog? I stumbled on this recipe while looking for some treats to take to a cookie exchange for our missionary team. We all live and work in Loja, Ecuador and finding recipes that will work for us is difficult. I and my son have celiac’s, another team member’s son has an egg allergy, and yet another a peanut allergy. You can imagine that with the limited ingredients we have here that allergy baking can get difficult. The only ingredient on your list that I had to substitute were the Quinoa flakes which I substituted with just plain ol’ quinoa. I also do not have access to coconut oil and had to use vegetable oil. Next time I make them I will try pumpkin in place of the oil (apples for applesauce are outrageously expensive here). My sons have declared these to be the best cookie they have tasted in their lives! I can’t wait to share the recipe with my other allergy inflicted friends! Hi Becka! This is such a wonderful wonderful treat to read! Thank you so much for coming back and sharing this news with me. These types of comments literally make my day and keep me loving what I do! I am so thrilled that you enjoyed these!! Thank you, thank you for letting me know! I followed the recipe using ground chia seeds in place of the egg and it just fell apart. I waited the full hour too. What do you think went wrong? I was so excited to make my own ‘power’ bars. Help! Hi Sharon! I am trying to think of what would have happened. I have made them successfully here with the chia-egg replacement and they were a perhaps a little more crumbly than the egg version but they did not totally fall apart. I am in AZ and it is really dry here so maybe the ingredients reacted a bit differently than in the humidity of CA (I saw on your blog that you are in LongBeach)? I am just trying to think what would have happened, but I am going to make them again today and try and troubleshoot what would have happened. My initial thought was that perhaps you need just a bit more water to the chia slurry since chia is so absorbent. The only thing I can say is that I may also make these again when I am at my beach house in Oceanside for Spring break and see if making them at sea level will alter the consistency/texture. Oh thank you! I agree, the chia slurry probably could have been a bit more watery and I subbed out the maple syrup with agave nectar. I’ll try adding some honey and a regular egg since I don’t have a problem with eggs. I ended up putting the mixture in an air-tight container so I could use it for a snack (kind of like a trail mix) and my husband thought he could top his yogurt off with it. Hummm, perhaps over coconut ice cream too! Let me know what you find out when you make it again when you’re here on spring break! These are in the oven right now! Used buckwheat flour (finally a good use? hate the stuff) and subbed coconut flour for the quinoa flakes. Two small batches – one with choco chips (and slightly ground up sunflower seeds for better digestion) and the other with choco chips, raisins and shredded coconut (and same seeds). 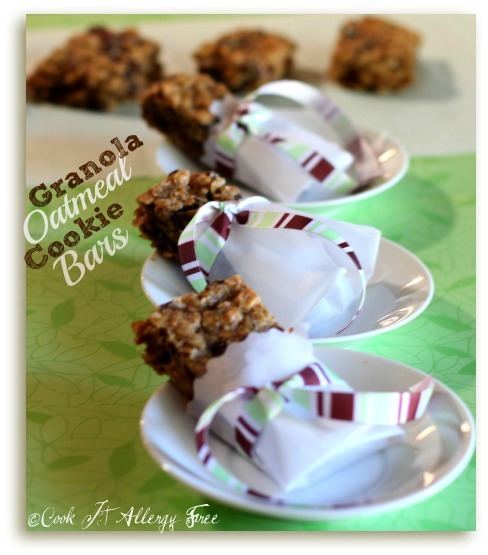 Def more steps than the other granola bars I used to make but these are soooo much healthier! Can’t wait to try them! Hi Valleygirl! Cannot wait to hear they turn out. A few more steps for sure…but worth it for an extra punch of nutrients! ;D Hope you enjoy them… Thanks for giving the recipe a try and putting your creative spin on them. They sound great! I am going to make these for my 3 toddlers today! My 3 yr old is so picky but he loves the crap store granola bars. He was a little skeptical of the balls so hopefully these go over better. That,s for all the ideas! Hi there, these are awesome, I have made them many times and just printing out the recipe to do it again. I found that they are very moist when using the recipe as it is written with the egg, the coconut palm sugar and the coconut oil. They travel well and when I was on a trip for work, my friend made some for me and now she makes them as well. Love, Love, LOVE them! Thank you SO much for coming back and reporting about these Eve! I am SO happy that you enjoy them so much and have so much success with them! Thanks for sharing your thoughts here! 🙂 Hope you have a fabulous week! Hi these look yummy. Ta so v much. Curious why do you state grade b maple syrup. I thought grade a is superior? Do you know if Canadian farms add a pork emulsifier to their syrups? Heard this the other day but looking for confirmation. I currently use Coombs family farm maple syrup grade a. Thnx for all you do. Just found your site. Peace 2 all.